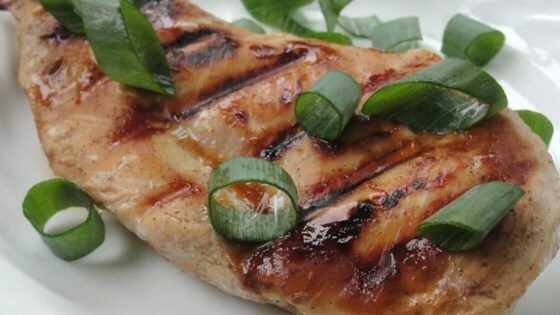 "This fabulous, quick and easy teriyaki marinade is great for all meat types and kabobs. It works especially well with pork chops. The longer the meat marinates, the better it will taste!" In a medium bowl, mix water, brown sugar, soy sauce, garlic, and cinnamon. Place desired meat in the mixture. Cover, and marinate in the refrigerator at least 2 hours before grilling as desired. They did have a lot of flavor, I just didn't appreciate it and neither did my husband. If I make this again I will leave out the cinnamon. I prepared this marinade as stated -- the taste was wonderful. I've used it on chicken and pork. Both turned out great! Awesome marinade - easy and delicious! I prepared just as directed, the cinnamon gave it a great flavor I didn't expect!